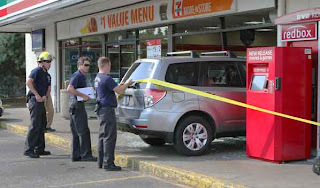 This recent crash into a 7-Eleven store in Portland, Oregon, reminded me a little too much about my own encounter with a vehicle about four years ago at a 7-Eleven. In both instances, the driver was elderly. Luckily, no one was injured in this Portland episode. As the East Portland News notes: "It is not clear if the driver had had a medical issue which caused the incident, or if he had just become confused and stepped on the gas instead of the brake." Given how frequently these types of accidents happen, I just shake my head when I see that useless shallow curb in front of the 7-Eleven. It's so easy for a vehicle to roll right up and over that curb — and keep going right through the glass — as you can see. Thanks to David Ashton at East Portland News for covering the story and for allowing use of the above photo. Thanks also to Rob Reiter for the heads-up on the crash.